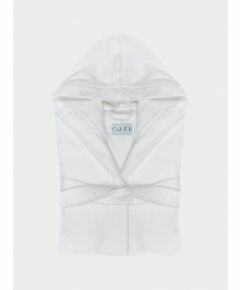 This luxurious, 100% pure turkish white cotton bathrobe is just perfect for snuggling into on chilly winter evenings and for cheering up those early morning starts. They are also great for wrapping up in after that leisurely shower or bath. Made from top grade cotton sourced from the legendary terry producing Denizli region of Turkey, this robe is produced to their own design, by a small family owned factory in Turkey, which has a real passion for what they do and for the products they produce and which prides itself upon its sustainable and ethical approach to production. Turkish cotton is renowned for providing the perfect balance between absorbency and softness. Of exceptional quality and weight, their bathrobes are highly resistant to snagging and flatteringly cut to avoid a bulky appearance. Moreover, with each successive wash they become even softer and fluffier. 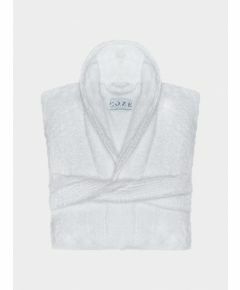 Nothing provides an ambience of luxury in the bathroom or bedroom more than a classic white fluffy bathrobe.